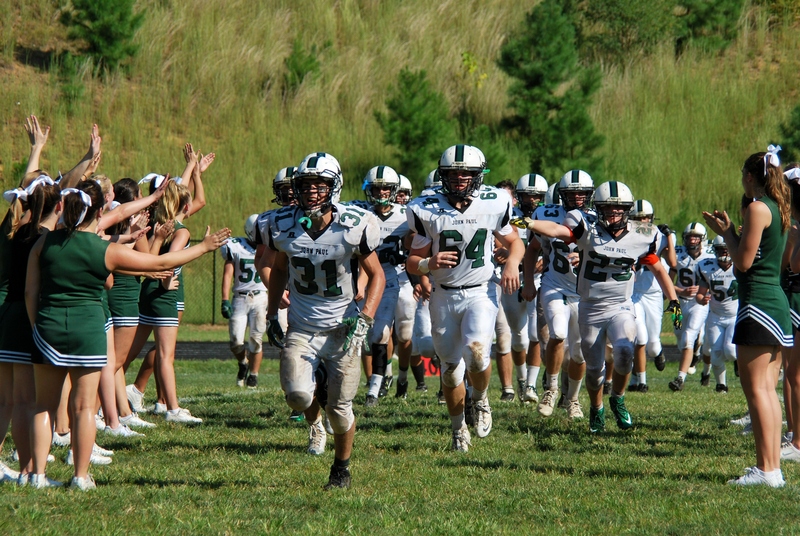 On a hot Saturday afternoon, the varsity football team took the field for their first home game of the season. They sought their first win in school history over The Potomac School Panthers from McLean. Four years ago, Potomac knocked John Paul out in the first round of the playoffs after JP made the postseason for the first time. Last season, the Panthers rallied for a decisive victory over the Wolves, and the Wolves were not planning on a repeat. After losing their season-opener last week to Nansemond Suffolk, John Paul was excited to go for their first win in front of their home crowd. The game started off sloppy with three turnovers between the two teams in the first quarter. The Wolves fumbled, and then Potomac fumbled it on their first offensive play. With 6:32 remaining in the first quarter, the Panthers intercepted a pass and ran it back for a touchdown. After the extra point, the score was 7-0 and it remained that way the rest of the first. As the first quarter came to a close, the Wolves marched down the field. On the first play of the second quarter, John Paul scored a touchdown but failed to convert the two point conversion. Potomac thus held a 7-6 lead. The plethora of two point conversions for the Wolves on the day was due to the unavailability of their regular kicker. With four minutes and 15 seconds remaining before halftime, JP added another touchdown. This time, their two point conversion was successful and the Wolves took their first lead of the game at 14-7. Potomac responded fairly quickly however. In the closing minute of the half, the Panthers threw a long touchdown pass and proceeded to fake the extra point. They converted for two points and took a 15-14 lead into halftime. The third quarter was relatively quiet, as maybe the heat began to set in for some of the players. 31.8 seconds remained in the quarter when the Wolves added another touchdown but once again failed on the two point conversion. This resulted in a 20-15 lead for John Paul. Just over two minutes into the fourth quarter, Potomac regained the lead with a touchdown of their own. They converted the two point conversion, but it was called back on a penalty. On their second try, the Panthers were unable to get the ball into the end zone, and this left them with a 21-20 lead over John Paul. The play of the day came with 6:53 remaining in the game. Junior Brandon Perroots passed to senior DJ Stefonsky, who turned to run. 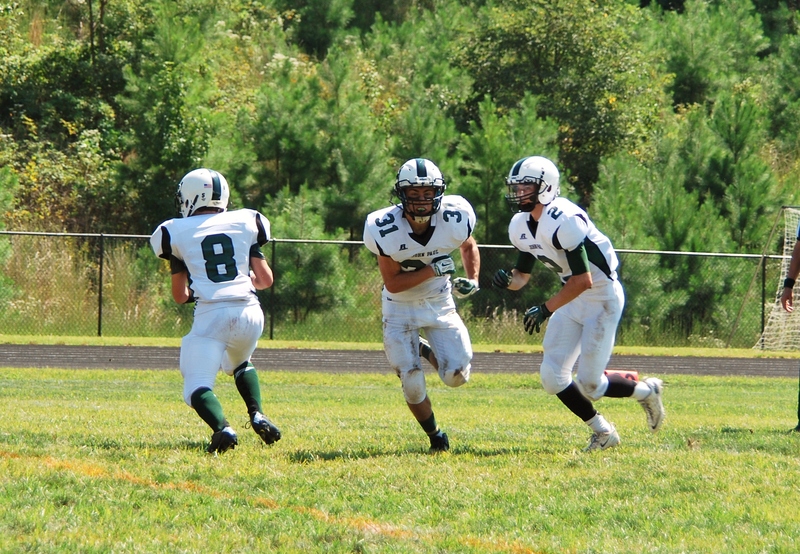 As Stefonsky was about to be tackled, junior Michael Horan came around and caught a lateral from Stefonsky. Horan ran down the sideline about 20 yards and scored what would prove to be the game winning touchdown. “This win has been a long time coming for John Paul. I can’t explain how great it feels to beat Potomac for the first time. It was a team win,” Horan said after the game. In the final minutes, John Paul was forced to punt and that gave the Panthers a chance to tie the game. With just under 40 seconds to go, Horan intercepted a pass to seal the deal. All that was left for the Wolves was the obligatory kneel-down before the celebration could begin. The final score was John Paul 28, The Potomac School 21. The Wolves had finally beaten the Panthers for the first time in school history. “Everyone worked so hard for this win. I’m very proud of the team,” said junior Michael Foster. 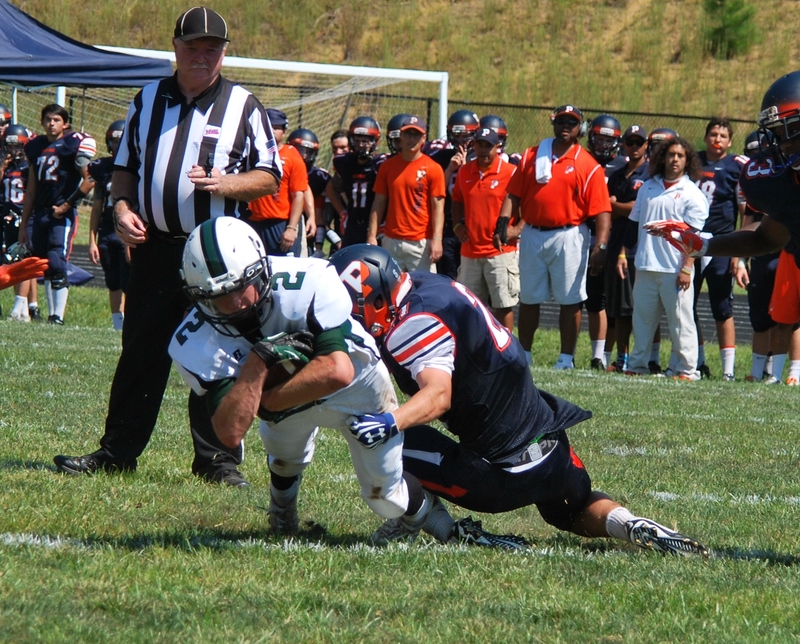 The Wolves travel to Randolph-Macon next weekend before returning back home on September 20th. This entry was posted in Football, Home, Men's Sports and tagged Brandon Perroots, DJ Stefonsky, Michael Foster, Michael Horan, Nansemond Stuffolk, Randolph Macon Academy, St. John Paul the Great, The Potomac School, Varsity Football. Bookmark the permalink. Paul, you write great sports articles! We really enjoy reading them- you really make the reader feel the excitement of the game, even if there were not there to see it live. Thanks Mrs. Horan! I appreciate your support!